This section will give you direct guidance and useful tips on how to learn and practice reading sheet music effectively. First and foremost, it is recommended that you start the reading exercises with songs you are not familiar with, otherwise you will find yourself focusing not on reading the notes but the well-known melody of the song. I have included a list of widely-known songs in a separate section. Look up and comprehend Guitar-oriented music theory I. section, and then you will be able to turn the videos into tonality exercises, too. You can try to figure out the chord progression of the song. There may be more than one possible chord progression you can figure out. You can try to write the sheet music of the song. Verify using the original sheet music. There may be more than one possible versions. 1. – 4. – 10. – 13. 18. – 22. – 28. If you consequently follow the above order, afterwards you will be confident enough to just pick any song you want. But now let me show you something interesting. Given the above sheet music, you might think the tonality is C major or A minor, since there are no key signatures. Actually, the tonality is D minor pentatonics. Let me explain it to you: the standard key signature to a D minor is 1 flat. The reason why you cannot see that flat signature is that there is no B flat note in D minor pentatonics (where the flat should be placed at), as the scale consists of only 5 notes. The person that wrote this sheet music did not bother to indicate this, which could be justifiable only from music theory wise, not from an educational point of view. No to confuse you even more in case you found this little mistake, I did not change the sheet music in my version. Note this when browsing through sheet music and trying to play along! The key 1 flat signature suggests the tonality of the song is either F major or D minor. 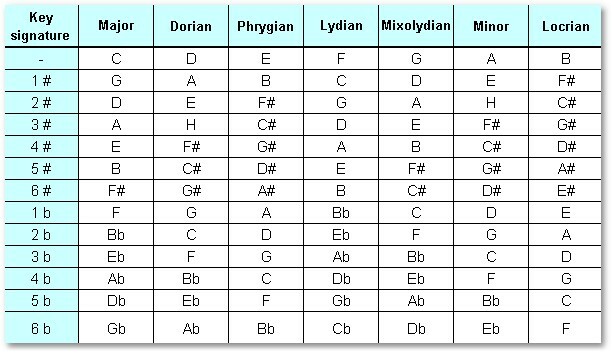 In reality, this song, which is Hungarian folk song, has a G Dorian tonality, as G Dorian is also one of the tonalities that have 1 flat key signature (see the table below).